Adrian Durban Florist was founded in 1899 and 1904! Ruth & Gus Adrian had a small shop in Clifton on Ludlow Avenue from 1899 to 1955. They also owned greenhouses just off Middleton Avenue in Clifton. The Adrians were good friends with the Durban family… friendly competitors and would help each other out here and there. In 1955, Ruth Adrian was not in good health and sold her company to 2nd generation Joseph Durban. Joe sent his son Robert to operate the shop on Ludlow. In 1956 the shop was moved to its present location at the corner of Clifton & Ludlow Ave. The Durban’s started in Northside in 1894. The company evolved from a small shop on Hamilton Avenue to greenhouses on McAlpin Avenue. The greenhouse operation was closed in the year 2000 as it was not cost effective to keep them operating. The design and customer service department moved to Blue Ash on Cornell Road in late 2000. Our Harper’s Point location was opened in 1997 and Ludlow remains as our flagship store and all stores are owned by the Durban Family…. Eileen Durban, Beth Durban and Kerry Durban. Through years of hard work, high energy, acute attention to detail, and an unwavering focus on customer service, Adrian Durban Florist knows that their loyal customers are the key to success, and are proud to have been named Cincinnati’s #1 florist for nearly 22 consecutive years. Serving the customer has been the number one priority of Adrian Durban since their first day in business. They have been open every single day since, and take pride in their YES WE CAN commitment – a pledge that empowers employees to create an exceptional retail experience for each and every customer. Their motto of “Exceeding Your Expectations” takes on a special meaning to ADF employees, it is a commitment to care for and honor the trust of every customer by providing personalized service and building long-lasting relationships. With the ever-changing advancements in technology, ADF remains a pioneer in the industry by staying at the forefront, and constantly looks for new ways to innovate in order to provide better service and more convenience for their customers. Coinciding with their focus on customer service, The Durbans also strive to provide only top- quality flowers and gifts for their customers. In addition to the hand-selected, highest grade flowers in the industry, Adrian Durban also partners with high-end manufacturers like Lenox, Murano, and Spode, along with specialized boutique outlets to provide unique and exclusive gift items for a true one-stop shopping experience. Adrian Durban is again the recipient of the 2018 “Best of Cincinnati” award in the category of Florists.This is the 22nd time that Adrian Durban Florist has been singled out for the prestigious honor. 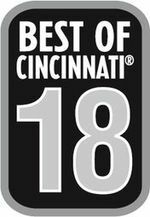 Adrian Durban Florist is honored to be selected for the 2018 “Best of Cincinnati” award. From around town to around the world, Adrian Durban is proud to serve all of their customers and is honored to be selected, once again, as Cincinnati’s #1 Florist.